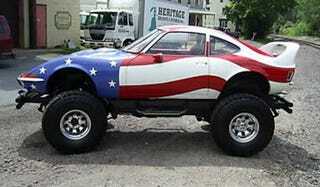 You know what the Opel GT needs? More off-road ability, that's what. This CJ5-based custom is actually overwhelmingly cool. The best part? It's for sale in Pennsylvania. Buy it now! Nice Price Or Crack Pipe: Opel GT Batmobile For $9000? This one of a kind vehicle was built from a 1969 Opel GT, a 1985 CJ7 Jeep frame and a 1978 CJ5 Jeep drive train. The engine is a new crate engine, a 258 cubic inch straight 6 cylinder with 200 miles clocked since building the vehicle. Transmission and transfer case is original 78 CJ5 (3 speed). List of new parts: 258 cubic inch straight 6 cylinder, oil pump, electric fan speed control, all new gaskets, distributor, cap, rotor, plugs, wires starter, clutch and pressure plate, U-joints, steering box, poer steering lines, carburator rebuild kit, 3in suspension lift kit(springs, shackles, shocks, U-bolts), brake shoes and pads, calipers(front), wheel cylinders and drums(rear), stainless steel braided caliper brake hoses, stainless steel brake lines with protective spring steel, master cylinder, vaccum booster, 35 inch tires, chrome wheels and lugs, windshield and rear window rubber, door and door window rubber, wiper blades, racing style seats, carpet, dash mat, bumpers(welded 3 inch schedule 40 pipe), 2 sets fog lights, red underglo kit, 11 inch high rear spoiler. Title is "Modified". The car is inspected and street legal. [via eBay] Thanks for the tip, Ben!